Hillman's popular Christmas carol for SSA voices, Who Would Have Thought, will be published by Cypress Choral Music (Vancouver, BC) in the spring of 2012. Beginning in January 2012, Hillman will be teaching a choral music course for Boston University's Metropolitan College/Prison Education Program at a large, medium-high security men's prison in Massachusetts. Hillman and Andre de Quadros presented their research and shared their practical experience on choral singing in prisons at the American Choral Directors Association's Eastern Division Conference in Providence, RI on Friday, February 17. Hillman will be doing a residency with the Windsor Classic Chorale (Windsor, ON). While in Windsor, he will be leading workshops for school and church choirs and performing as tenor soloist in the Chorale's 35th anniversary concert. Hillman won the Canadian Federation of Music Teachers Association's Call for Compositions. His piano piece, "Land of the Silver Birch", is published on the CFMTA website and will be performed by young pianists from coast to coast during Canada Music Week (November 18-24). 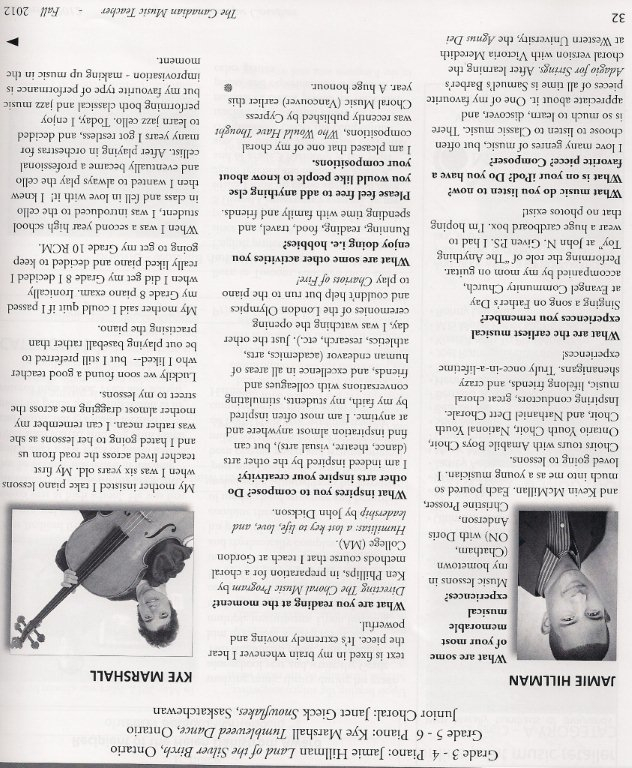 An interview on Hillman's compositions and musical career will be featured in the September 2012 issue of The Canadian Music Teacher. Hillman presented "Crossing the Great Divide: Choral Singing in Prisons" at the Yale International Choral Festival/Choirs Transforming Our World at Yale University. Hillman and Emily Howe were awarded the Boston University Prison Arts Scholar Award "in honor of their commitment to bringing music appreciation to MCI-Norfolk and MCI-Framingham, through BU's Prison Education Program." Hillman will give a public lecture with Andre de Quadros on their research and work as part of the Citizens Artist Series on November 19 at Boston University. Hillman performed as pianist in a performance of the two piano and percussion version of Orff's Carmina Burana with the Clark University Concert Choir, directed by Dr. Christine Noel. Hillman is the winner of the Leslie Bell Prize for Choral Conducting from the Ontario Arts Council and Choirs Ontario. Hillman will be presented with the award at the Chatham-Kent Children's Chorus Christmas concert on Sunday, December 16.